In this review, we check out the sequel to Breakout, Super Breakout. We find out if this “super” version is really a “super” version of Breakout or not. 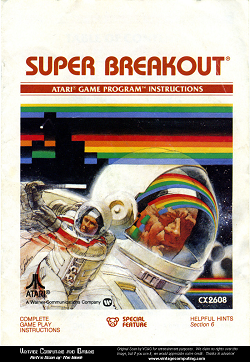 Supre Breakout was released in 1981. It is a sequel to the original Breakout game which we reviewed earlier. Super Breakout really is just Breakout in many ways. There are still breaks to break with the ball and paddle. There’s still that rainbow of color in bricks. There’s even still that gradual increase in points the higher you go up on the layers of bricks. One thing I was disappointed in seeing was that sudden jump in difficulty the second you bust a brick on the top two layers. I will say, however, that the difficulty wasn’t quite as high as before because the ball doesn’t move quite as fast when it does speed up. One glitch that I wished was fixed was the ball passing through bricks at certain angles. Unfortunately, in this version, if your ball approaches a brick from the side after hitting another brick, it’ll still pass through other bricks in the process. One new thing is the fact that if you manage to get the ball through to the ceiling and it starts busting bricks bouncing back and forth, your paddle will decrease in size, making the game more difficult. The ceiling and brick busting motion seems to be what triggers it most of the time (at least for me). Graphically, there isn’t a whole lot of difference between this and the prequel. The sides are more uniform and the ball briefly changes color when you hit a brick. These, however, seem to be the only changes. Everything else is quite similar or the same. The audio saw some improvement. Instead of just little pings, there is the added tones that are emitted while hitting bricks. If you hit a first layer brick, you’ll have an individual ping. If you hit a top layer brick, it will emit several tones in a row to indicate you earning more points on that particular hit. While this is a small change, this was a nice improvement over the previous game. Overall, for a sequel that proved to be three years in the making, there really isn’t a whole lot that has changed. You still have five balls to play with and the basics are also all there. Really, this is just a tweaked breakout more than anything else. Furthest point in game: 440 points which requires getting to the second wall.